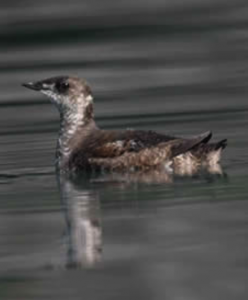 General Information: The Marbled Murrelet is small chunky, long-lived seabird. This bird is unique among aclids, including other murrelets, in that it nests high up in large coastal trees. In the Pacific Northwest, these species can be found nesting up to 50 miles inland in old-growth forests. The species has a global population of 385,000, with 70% of the population residing in Alaska. It is a member of the alcidae family. Range: The Marbled Murrelet can be found along the Pacific coast from northern Baja California out into the Aleutian Islands. This chunky little seabird can be found year-round in Kachemak Bay and Cook Inlet. Characteristics: Often found in pairs, but in protected bays in Alaska, the Marbled Murrelet can be found in groups numbering around 50 birds. In breeding plumage darkish-brown overall. In non-breeding plumage a black cap and cheep patch, white collar, white scapulars, white breast and vent. Fairly long bill. They forage, loaf, molt, preen, and undertake courtship displays in near-shore marine waters. 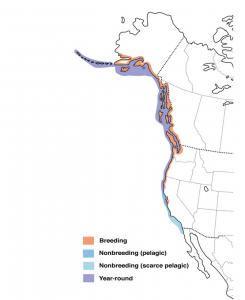 Preferred Habitat: This bird spends all of its time on the ocean, except when breeding. Winters at sea. Nests: Moss-covered platforms on large moss-covered limbs in old-growth trees (200+ years old). In treeless areas in Alaska, the bird nests on the ground or in rocky cavities typically within one-mile of shore, but no more than four-miles from shore. Eggs and Incubation: Egg laying begins in April through late June/early July. Only one egg is laid. Nestlings are semi-precocial and downy. The nest is tended by both parents and hatchlings are brooded up to three days (birds stay in the nest). Fledging: The chick leaves the nest 27-28 days following hatching, flying either to sea or a lake near the coast. Food Preferences: Marbled Murrelets are opportunistic feeders, consuming small fish (e.g, Sand Lance, Capelin, Herring) and crustaceans (Shrimp, Mysids, Euphausiids, and Amphipods). Feeding Methodology: Surface diver, foraging in shallow water (100 feet or less). Uses it wings to swim under water to catch fish. Prefers waters at the mouth of rivers and glacial streams, however, it can be found foraging 30 miles out from shore. Migration: Some birds move south in the winter. Vocalizations: Call is a high, gull-like squeal. At dusk a clear “keer, keer, keer” call. Threats: Habitat loss is the primary threat in the lower 48, where more than 95% of its habitat has been logged. In Alaska, threats include changes in food availability, avian predators, incidental by-catch in gillnet fisheries, and loss of habitat through old-growth logging. Marbled Murrelets are vulnerable to oil and marine pollution. The Marbled Murrelet usually nests in trees greater than 200 years in age – old growth. While the bird was first described in 1789, it wasn’t until almost 200 years later that the first nest of Marbled Murrelet was discovered and formally documented. The Marbled Murrelet was once known as the “Australian Bumble Bee” by fishermen and as the “fogbird” or “fog lark” by loggers. Conservation Status: This species is declining and along the Pacific Coast (California, Oregon, and Washington), the species is listed a threatened under the Endangered Species Act. In Alaska, the Marbled Murrelet is on the Alaska Audubon “Alaska Watchlist 2017 – Red List”. Species on the “red list” are either have declining or depressed population trends. Although the Marble Murrelet has declined in population, it population has stabilized over the past decade. The International Union for Conservation of Nature lists the Marbled Murrelet as endangered; its population trend decreasing. 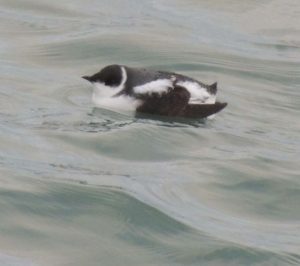 Similar Species in Alaska: In the Alaska, other murrelet species include the Kittletz Murrelet and the Ancient Murrelet. 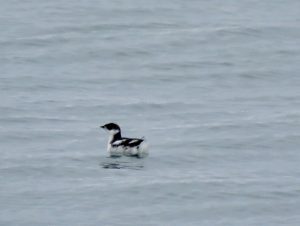 Occasionally, the Long-billed Murrelet strays into Alaskan waters, including Kachemak Bay (this bird breeds in Siberia). Cornell Lab of Ornithology. All About Birds – Marbled Murrelet. https://www.allaboutbirds.org/guide/Marbled_Murrelet/overview Downloaded on 11 April 2018.
International Union for Conservation of Nature. The IUCN Red List of Threatened Species. Version 2017-3. <www.iucnredlist.org>. Downloaded on 11 April 2018.